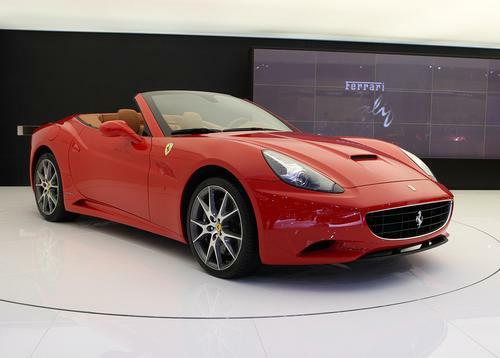 The Ferrari California finally made its official debut at the Paris Show after a series of special previews on the web and during two dedicated events staged in Maranello and Los Angeles at which it received a hugely enthusiastic reception. The Ferrari California is an exceptionally innovative car whose philosophy takes its inspiration from the spirit and emotions of one of the great Ferraris of the past, the 1957 250 California, a superbly elegant open top car designed for the track, which has, over the years, come to symbolise not only superior sportiness and performance but also exclusivity, craftsmanship and faultless sophistication. 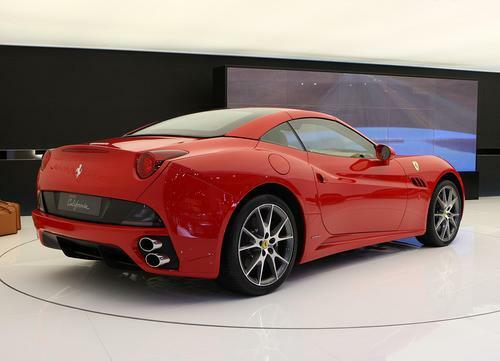 This is the fi rst V8 in the history of Ferrari road-cars to be mid-front mounted. Built entirely from aluminium, it retains the typical Ferrari architecture with a 90° angle between the two cylinder banks and a 180° angle between the cranks. The engine has a total displacement of 4,300 cc and a maximum power output of 460 hp/338 kW at 7,750 rpm. With a specifi c power of 107 hp/litre, its maximum torque is 485 Nm (49 kgm) at 5,000 rpm, 75% of which is available at just 2,250 rpm. The Ferrari California takes less than 4 seconds to accelerate from 0 to 100 km/h and delivers a blistering 310 km/h top speed. The new V8 features direct fuel injection and variable timing (on both intake and exhaust) to guarantee superb performance, exceptional handling and fuel consumption and emissions that easily comply with the toughest Euro 5 and Lev2 standards. Thanks in part to these solutions, the Ferrari California consumes just 13.1 litres/100 km (ECE combined) and has carbon emissions of 305.6 gkm (ECE combined). The California’s engine sound was also carefully developed as this is one of the great Ferrari signatures and really does contribute to enhancing driving pleasure. Particular attention was lavished on sound perception in the cabin both with the top up and down to ensure that trademark thrill without compromising on occupant acoustic comfort. The Ferrari California sports a new dual clutch gearbox (7-speed + reverse) with the now traditional steering wheel-mounted F1-style paddles. This is an innovative system that guarantees a superb combination of performance and ride comfort. With the dual clutch, one clutch is used for even-numbered gears and the other for odd-numbered ones, and allows the pre-selection of the next gear required.The gears are changed by overlapping the opening and closing stage of both clutches, resulting in gearshifting times that are close to zero and with no torque interrupt. The result is not only enhanced performance but truly thrilling driving pleasure. The traditional transaxle layout (engine to the front and gearbox to the rear) also contributes to the California’s perfect weight distribution (47% front - 53% rear) and to reducing vibration to the bodyshell. In manual mode, the new gearbox guarantees great sporty driving pleasure while extra comfort is assured in automatic.